Stills from ART/new york #5, “New York/New Wave at P.S. 1: The Armory Show of the ’80s.” The 1981 documentary will be shown as part of a new exhibition at P.S. 1. Excerpts can be seen on YouTube. P.S. 1’s “New York/New Wave” exhibition, organized by Diego Cortez in 1981, is one of the more memorable events treated in the new historical exhibition “A Bit of Matter: The MOMA PS1 Archives, 1976–2000,” which opens this Sunday, April 9, at P.S. 1. Visitors to “A Bit of Matter” will be able to relive “New York/New Wave” thanks to ART/new york’s vintage documentary video, produced and directed by Paul Tschinkel, with text and interviews by Marc H. Miller (now of Gallery 98). Cortez surely caught a “new wave” of New York art. The early 1980s were a moment of generational change for the art world, as baby boomers descended into downtown New York and grabbed pieces of the limelight. Cortez pulled many of the exhibition’s nearly 100 artists from the fringes of the city’s exploding music and nightclub scene. The “New Wave” classification didn’t stick in the art world as it had in the music industry, but many of the artists in the P.S. 1 exhibition—Keith Haring, Jean-Michel Basquiat (then billed as “Samo”), Marcia Resnick, Robert Mapplethorpe, Futura 2000, Nan Goldin—have since become household names. With the innovative documentary series ART/new york, Paul Tschinkel presciently took advantage of newly affordable and portable video technology. Over the years, ART/new york has grown to be an essential art historical resource. The “New York/New Wave” documentary features narration by Marc H. Miller, who helped curate the 1978 “Punk Art” exhibition at the Washington Project for the Arts. Along with installation footage of the exhibition, the tape includes footage of the “no wave” music group DNA and interviews with painter Curt Hoppe (whose X-rated political cartoons from Screw magazine were exhibition highlights) and curator Cortez (who describes the show as a “sociology of elements that make up a scene”). 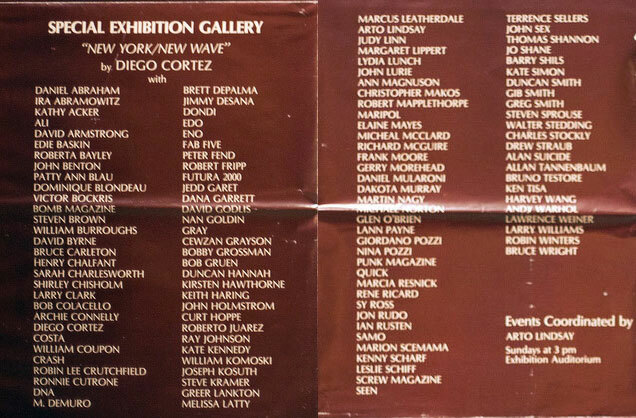 “New York/New Wave” artists list; detail from P.S. 1/Clocktower flyer, 1981. Courtesy Curt Hoppe.